The domestic two-wheeler market has taken a major shift in the recent past from scooter and mopeds to the motorbikes and auto-gear scooters. The new entrants have also raised the ante by introducing new models. Q: I am employed in a Pvt. Ltd Company. I have made investments in ICICI tax saving bonds which is maturing this year. They have deducted tax of about Rs 800 on interest. I do not have any other income other than salary and interest of about Rs 8,000. Do I have to disclose this interest income to my employer? A highly aggressive investor, Mr Balwinder S Kalsi's interest in equities increased to such an extent that he left his job around ten months ago and is today actively involved in the share market. 2001 was the second consecutive year when the sensex added at a lower level than the previous year. If one is a student of the Indian equity market, it is worth noting that this has happened for only the third time in the history of the BSE. A good professional management is a vital factor for the healthy growth of a company. A bad family management can mar its prospects as Vikas WSP illustrates the truth of its analysis. This company, managed by a family management, was performing very well with excellent fundamentals and profitability. The domestic two-wheeler market has taken a major shift in the recent past from scooter and mopeds to the motorbikes and auto-gear scooters. The new entrants have also raised the ante by introducing new models. The Bajaj Autos and Hero Honda Motors Limited are fighting to get a dominance in the north India's motorcycle market, though Bajaj's Chetak model still rules in the scooter segment, especially in the rural areas. The market experts admit that the sale of two-wheelers has been affected, to some extent, by general recession and deepening war clouds over the Indian sub-continent. However, the increasing rural incomes, fall in rate of interest, and almost nil chances of decrease in excise duty in the coming Budget, have triggered the sales in the last quarter. Interestingly, the market leaders have not adopted the strategy of price cuts and freebies to boost sales on the eve of new year or festivals during the current fiscal. They are rather banking on expansive advertising campaigns, competitive finance schemes and the launch of new models to get a niche in the market. Mr Naveen Vashisht, Area Sales Manager, and a keen market observer at the Bajaj Autos Limited, Chandigarh disclosed that the average sales of two-wheelers per month in the Punjab market during April-November, 2001 was 19,500, which included 10,087 scooters and 7,059 motor cycles. While in the motor cycle market, the Bajaj Autos and Hero Honda are leading neck to neck, by holding about 40 per cent share of the market, but in the scooter market, the Bajaj is holding more than 83 per cent share followed by LML and Kinetic respectively. 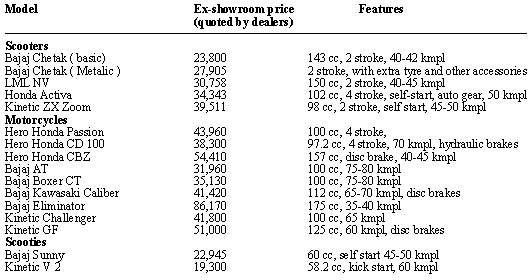 He claims that in the entry level segment market of bikes, company's Boxer AT and CT are selling like hot cakes, due to reasonable price and above-average mileage. The per litre average of these 100cc bikes is between 75 and 80 kms. The Bajaj Kawasaki Aspire and Caliber Croma have been launched for the executive class and Eliminator-175cc bike at a price of Rs 86,170, for the premium segment. The company has also launched CT Croma and Pulser. The customers say that the Caliber Croma's real strength lies in a rock-hard chassis that reduces vibrations, and has disc brakes with two year warranty of the bike. Despite increasing heat of the competition, the Hero Hondas is still trying to hold the 100 cc market through Splendor and Passion priced at Rs 38,500 and Rs 43,960 respectively. “The Honda bikes can be easily financed through Centurian bank at 11.75 per cent rate of interest. The established brand name, good mileage and attractive looks are pushing more than 3000 bikes per month in the Punjab itself,” says Ms Pooja Divedi, Finance Manager at a leading agency here. She admits that the Hero Honda bikes are preferred by educated urban youth and executives to the ruralities, where the financiers are not ready to take risks due to fluctuating and difficult to calculate agriculture incomes. The bankers say that the buyers are certainly attracted by zero per cent finance and other attractive schemes, offered by the Bajaj dealers. The wider network of dealers, service centres and easy availability of spare parts in the market at lower rates have also positively affected the sales of the Bajaj brands. The TVS's indigenously developed 110 cc Viktor is also doing reasonably well, but the Yamaha seems to have loosened its stream in the intensifying competition. The market watchers also appreciate Kinetic's recently launched 97 cc, 4 stroke, Challenger ( Rs 41,801 ex-showroom price ), which has additional features such as digital gear side, stand indicator and adjustable shock absorbers. The company has also brought out Kinetic GF 125, the only 4-stroke, 4-valve engine motorcycle, claims company, that would give more power per cc. Its well contoured fuel tank adds to its sporty heavy look and aerodynamic design. In the scooter market, the company has recently introduced Kinetic ZX Zoom, which does not have much additional features in comparison to DX model. Honda's Activa model has already started affecting the sales to the tune of 40-50 per cent per month in the region. The scooty market is continuously on decline by Bajaj's Safari, TVS scooty are doing well yet. The well-informed consumers and dealers admit that there was a lot of potential in the north India's market to increase the sales of motorcycles and auto-gear scooters. The share of motor bikes in north Indian market is about 46 per cent, in two wheeler market, against 71 and 61 per cent in the eastern and western market. They say that the manufacturers would have to share the profits with consumers, instead of just relying on advertising campaign. The entry of Chinese bikes, which could force them to cut down prices, may have been stalled by higher duties for the time being, but it cannot be postponed forever. They would have to come up with more fuel efficient and cheap models, that are still determining factors to boost sales. Will I get the benefit of Sec. 80L of the IT Act. i.e., whether the tax deducted on interest is adjusted against tax on salary? 2. As per the new amendments, telephone provided to employee at his residence is not a perquisite. Is it necessary that the telephone should be in the name of the employee? If the telephone is in the name of the employee and the bills are settled by employer, does it amount to non-taxable perquisite? Whether telephone includes Mobile phones? A. 1. As per Sec. 192(2B), where a salaried employee receives income under any other head, he may give the particulars in Form 12-C along with the proof of interest paid on housing loans to his employer for taking cognisance of the same and adjust the TDS on salaries. Deductions u/s 80CCC, 80D, 80DD, 80DDA, 80DDB, 80E, 80G (with some reservations), 80GG and 80U as well as rebates u/s 88, 88B and 88C should be taken into account. Have you noticed that 80L does not feature in this list? The employee can take into account deduction u/s 80L while submitting this information. Tax Saving Bonds of ICICI are eligible for 80L benefit. 2. Telephone includes mobile phones. These can be either in the name of the employer or employee and the bill can be either directly settled by the employer or reimbursed to the employee. Q: I have been given to understand that minors and HUF is prohibited to open/contribute in PPF account since December 2000. Is it true? If yes, kindly provide with the details of the Notifications and Orders effecting such change. Why the contributions are still being accepted? Whether the depositors are allowed to close their minor/HUF account at one go? A: 1. Yes it is true but only if the minors and the HUF have no income of their own and the contribution is made out of the income or the assets of the assessee. The Notification number is GSR 908(E) dt 6.12.00. 2. The deposits are still accepted because SBI is least bothered to put the investor on the right line. As a matter of fact, I am told that many of the SBI officers are still not aware of the notification! 3. No PPF account can be closed before its maturity unless the account holder dies. A PPF account of an HUF cannot be closed even when its karta dies — forget that — even when the HUF is partitioned in metes and bounds with the approval of the ITO. I am developing a feeling that it is becoming more and more dangerous to go in for any of the NSO schemes, mainly because of the quality of the personnel handling it and also drafting of the rules. Q: For indexation purposes (to calculate capital gains) what is the magic number presently used? A: Does it really matter? RBI declares it and you have to use it. However, here is an answer to satiate your inquisitiveness. Cost Inflation Index, in relation to a previous year, means such Index as the Central Government may, having regard to 75 per cent of average rise in the Consumer Price Index for urban non-manual employees for the immediately preceding previous year to such previous year, by notification in the Official Gazette, specify, in this behalf. A highly aggressive investor, Mr Balwinder S Kalsi's interest in equities increased to such an extent that he left his job around ten months ago and is today actively involved in the share market. It was his first job itself (in the share ad secretarial assistance department of a company) that developed his interest in equity market and then onwards, his only investment priority has been shares. A company secretary, he has an experience of more than 19 years of service in companies like Punjab Alkalies, Agro Dutch and others, to his credit. Soon after I started my career in 1982, I began putting my money into shares. Nahar Spinning was the first share I bought and it proved out to be a good deal. I bought an insurance (money back) policy in late 80s and for liquidity purposes, put some money in bank. One's decision to invest in shares depends upon the risk taking ability, attitude and knowledge about the market, in absence of which it won't be wise to go in for equities. Right from my first buy, I have been careful enough to invest only after a thorough analysis of the company and market trends. That includes the company's future policies, past performance, policy towards investors and management. Currently, I am holding shares of Castrol, Dr Reddy, Agro Dutch, Reliance Petro and Hero Honda- all of which I feel will do well in the coming days. Of my total savings which hover around 50 per cent of my income , I have been investing more than 80 per cent in the equities. In the coming days, I think old economy shares will show best performance. It is advisable to spread one's investments in various sectors rather than concentrating on one, like many people did in case of Information Technology (IT) shares and lost. Decisions at the right time is what matters the most in case of shares. One should make it a point to decide the future price at which one will sell the share. But within that time also, review of decisions should be done. These days quarterly performance data are available , so it is easier to decide. After you buy, review the decision — if you think the share is performing better than your expectations, sell off your basic investment and retain the rest, but if the share is not performing as per your expectations, it is best to dispose it off immediately. I don't invest in MFs, but if I have to, my preference would be debt funds due to the safety and returns factor. Equity Funds I feel are liking giving someone else the power to decided which shares to buy for you, so I would rather depend upon my own judgement rather than going for equity funds. It is very important to be fully insured and have a medical insurance policy. I bought insurance policy during the initial years of my career itself and am having three policies. I am also planning to buy a policy from some new private insurance company because I feel these companies are financially sound and are offering attractive products with riders. To assure sufficient liquidity, I keep some money in bank . Banks are the safest option, but very unattractive on returns. A small portion of my savings is also put in PPF account. Though I personally am a high risk taking investor, I believe one should have a balanced investment strategy, that is, a good mix of high return giving, liquidity offering and safe investment. 2001 was the second consecutive year when the sensex added at a lower level than the previous year. If one is a student of the Indian equity market, it is worth noting that this has happened for only the third time in the history of the BSE. Thus, the odds and the statistical evidence, it seems, favour a sensex bounce-back during 2002. The quarterly results season is beginning and the focus as always is on the infotech sector. Notably, the collective market capitalisation of 144 IT companies fell from around Rs 1,57,000 crore to around Rs 91,000 crore during 2001, representing a drop of over 40 per cent compared to a drop of 18 per cent in the sensex over the same time-frame. Another fact worth noting is that infotech majors seem to have comprehended the advantages of avoiding a euphoric build-up to their declaration of results and have projected conservative growth figures for this quarter. Projections range from low-single digit growth to no growth and negative growth in some cases. Incidentally, the general consensus among marketmen at this point of time is that the sector will be well and truly on the recovery trail by the end of the first quarter of the next financial year. So be it. In the meanwhile, the BSE has extended the rolling settlement mechanism to all listed scrips. This resulted in the elimination of 8 per cent and 16 per cent circuit filters. At this moment in time, the 20 per cent limit is applicable, except for the 31 stocks in which futures and options trading is permitted and for whom the rise/fall is restricted to 10 per cent. The circuit filters which continue to be there despite the introduction of the rolling settlement is an anomaly in our team's opinion as it prevents a timely exit at the time of panic thereby increasing the risk. Furthermore, SEBI has also decided that stock exchanges will introduce the T+3 rolling cycle for all scrips from April 1, 2002. The new settlement system will replace the current T+5 cycle and help to reduce transaction costs for investors. At the moment the spotlight seems firmly set on the US-64 scheme of the UTI. The problem with US-64 is that it doesn't affect only the investors in the scheme, it affects every tax-paying citizen. It has already affected us in the past (in 1998) when the government salvaged the scheme with a Rs 33 bln (Rs 3,300 crore) bailout. As the NAV stands (roughly Rs 5.9) the government's bailout package this time around could be about a lot more. At a NAV of Rs 5.9, the discount to the repurchase price (Rs 12), which the government's bill towards the US-64 bailout could amount to over Rs 80 bln. Given US-64's assets under management, which aggregates approximately Rs 136 bln, a Rs 80 bln bailout works out to around 60 per cent of net assets! But do give this a thought — the money squandered in propping us US-64 could have been better deployed in propping up literacy, power, infrastructure and agriculture. Perhaps then, the economic outlook would have been a trifle less bleak. A good professional management is a vital factor for the healthy growth of a company. A bad family management can mar its prospects as Vikas WSP illustrates the truth of its analysis. This company, managed by a family management, was performing very well with excellent fundamentals and profitability. With equity capital of Rs 997 lakh, each share having face value of Re 1, it declared a net profit of Rs 10840.20 lakh, with EPS of Rs 10.87 per share (on a share of Re 1 face value), for the quarter ended March 31, 2001. On December 6, 2000, Vikas WSP announced preferential allotments of shares to strategic allies and promoters at Rs 8.25 per share (each share of Rs 10 face value). In other words, the preferential allotment was made at Rs 82.5 per share of Re 1 face value. It also announced setting up of a new plant for new products. So far so good. The company’s Rs 10 face value share quoted as high as Rs 900 at one time. The company’s share also found its place in the portfolio of a number of mutual funds. But the rent is the tale of misinformation and mismanagement. The company had declared an interim dividend of 50 per cent on January 4, 2001, when it had declared its third quarter results for the year ended 2000-2001, for which the record date had been fixed at June 2, 2001. this interim dividend has not been paid. No information has been sent to the shareholders about it. The company’s second quarter results for the quarter ended September 30, 2001 were also good and EPS was Rs 20 per share of Re 1 face value. In spite of these good results, the company did not pay the interim dividend. In fact, there were reports of some dispute in the family-based management. The company was delisted both at the Bombay Stock Exchange and National Stock Exchange. The company had announced annual general meeting with book closure from December 12-15, 2001. But it did not send any reports of its working to the shareholders. No one knows whether the annual general meeting was held by the company at all. No information has been released to the shareholders by the company in any newspaper. Annual results for the year ended March 31, 2001 have yet to be announced to the shareholders. It is a very fit case for SEBI to look into the affairs of this company and bring the management to the book. If necessary, it may order the company to be bound up and its assets distributed among the shareholders. In fact, this kind of mis-management is a slur on the Indian stock market and the working of corporate sector. The Ministry of Finance should look into it and order a thorough enquiry into its working. Thousands of small shareholders who depended upon its audited reports and invested in these shares at high prices (ranging from Rs 700 to 900 per share of Rs 10 each face value) are feeling helpless, not knowing what the company is doing. Without a thorough probe by the SEBI and the Ministry of Finance, this dark spot on the corporate sector cannot be cleared. During the last fortnight, the stock market went up and down on pure speculation. Though Infosys declared good third quarter results but profit-taking has brought its market price almost to the same level from where it had moved up. The annual industrial growth rate is even less than on per cent in November and the stock market will have to take notice of this annual slow down in the months to come.